Traveling across the length of India’s Himalayas, from his temporary residence in Himachal Pradesh in the west all the way to the eastern peaks, the Gyalwang Karmapa made an historic journey to Arunachal Pradesh. For many centuries, he has had a connection with this beautiful realm of high summits and Buddhist followers: his first incarnation, Dusum Khyenpa (1110-1193), visited and founded monasteries here, and the relationship continued with the 3rd and 4th Karmapas while the last visit was made by the 9th Karmapa Wangchuk Dorje (1556-1603). Aware of this former connection and wishing to hear his teachings, the Monpa people from the west of Arunachal requested their Chief Minister Pema Khandu to facilitate a visit by the Karmapa. Subsequently the Chief Minister and the Union Minister of State Kiren Rijiju worked tirelessly to make it possible. Concerning the Karmapa’s response to the official invitation, CM Pema Khandu reported, “I am very happy for the people that due to our good karma His Holiness accepted the invitation in one go.” Highlights of the Karmapa’s landmark visit follow. 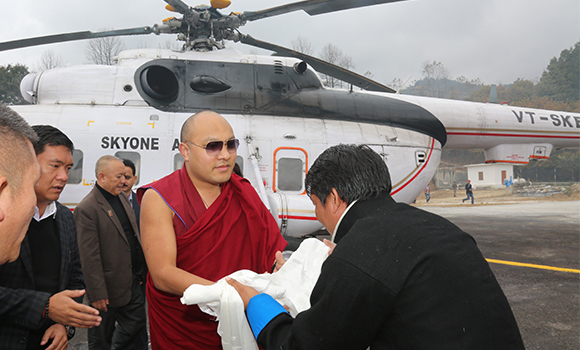 On the morning of the first day, the Karmapa arrived at the Guwahati Airport to a warm welcome from CM Pema Khandu who helicoptered with him to the Changprong helipad. Here, accompanied by Amitabh Mathur, an advisor to the Ministry of Home Affairs, His Holiness was given a grand reception by local government officials and religious leaders. From the helipad, he drove to Tawang Monastery with a stop at Sangyelling Monastery on the way. Passing through crowds of the faithful, the Karmapa paused to bless a few fortunate ones before circumambulating a majestic stupa and entering the main shrine hall for traditional rituals of welcome. 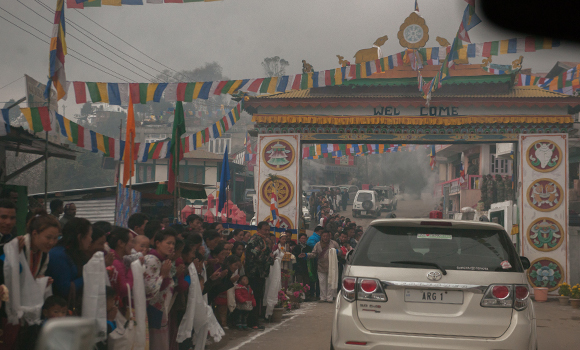 Resuming his journey His Holiness arrived in the town of Tawang, where the roads approaching its famous monastery were lined with women, men, and children holding their white scarves, flowers, and incense to give the Karmapa a warm and enthusiastic reception. They had been joyfully anticipating his visit and spent days in preparation, tidying up the approaching roads and whitewashing the walls. In a later interview the Karmapa said that this eager welcome had made him very happy. He felt the whole area to be peaceful and was glad to be reviving this 900-year- old connection. His Holiness first paid a visit to the Sera Jay Jamyang Choekorling Monastery where he was presented with the traditional offerings of a mandala and the supports of body, speech, and mind. Following ritual ceremonies, he witnessed the monks in a lively debate before departing to Tawang Monastery. Famous as one of the largest Tibetan Buddhist monasteries in the world, Tawang Monastery (officially known as Ganden Namgyal Lhatse) spreads its white and red buildings down green mountain slopes overlooking the Tawang River valley and the snow-capped mountains beyond. 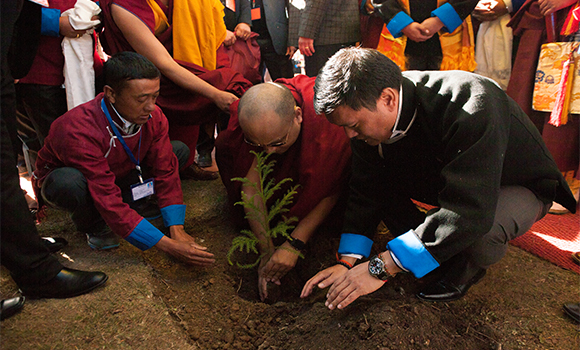 The Karmapa participated in a ceremony of planting trees at the monastery, an activity in line with his deep commitment to the environment. Afterward in the main shrine hall, filled with burgundy rows of the Sangha, His Holiness was offered another mandala and the supports of body, speech, and mind by the Abbot of Tawang Monastery, the Chief Minister, RWD Parliamentary Secretary Jambey Tashi, Tawang MLA Tsering Tashi and the various dignitaries who attended the program. Speaking to the assembly, the Karmapa expressed his gratitude, as he would throughout the tour, to the CM Pema Khandu and the Minister of State for Home Affairs Kiren Rajiju for taking the initiative of this visit and making it possible. Addressing the people who had gathered at the monastery, the Karmapa encouraged them to have unswerving faith in the Buddha’s teachings and in His Holiness the Dalai Lama. It is important, the Karmapa further advised, not only to study the Buddhist teachings but also to make them an integral part of our daily lives as well. He also stressed the importance of discipline for the monks and nuns and urged all the Sanghas to cultivate a resonant harmony among themselves, thereby preventing outside forces from hampering the progress of Buddhism in this Monyul area of Arunachal. The official program for the day ended with lama dances performed by the monks of Tawang Monastery and cultural dances of Monyul region offered by groups from various villages. On this second day, over 20,000 people gathered in the outskirts of Tawang at the High Altitude Stadium, facing the Yid Gha Chozin Monastery. From the Karmapa’s perspective on the monastery’s veranda, a massive crowd extended out in front of him like an ocean filling the encircled space. His Holiness bestowed the long-life empowerment of Amitabha and also gave teachings to everyone—the religious scholars, monks, nuns, high profile dignitaries, and the thousands who had come from near and far for this special occasion. After mentioning the views of Indian Buddhist Philosopher, Nagarjuna, His Holiness advised that maintaining good health is as important as receiving long life empowerments. The Karmapa encouraged everyone to practice compassion—the essence of Buddha’s teachings—and noted that it also promotes a peaceful mind, which in turn helps to extend our lives. The Karmapa further spoke of the long relationship between the Karmapas and the Monpa people going back 900 years to his first incarnation. 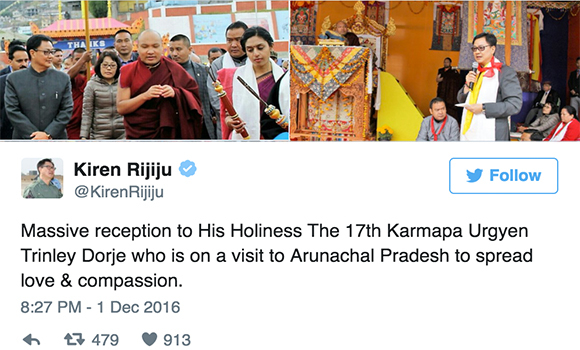 In welcoming the His Holiness earlier, CM Pema Khandu thanked the Prime Minister of India, Narendra Modi and the Home Minister, Rajnath Singh for honoring his request for the visit of the Karmapa to Arunachal. He also thanked the Minister of State for Home Affairs, Kiren Rijiju for pursuing the invitation and taking care of the necessary formalities. 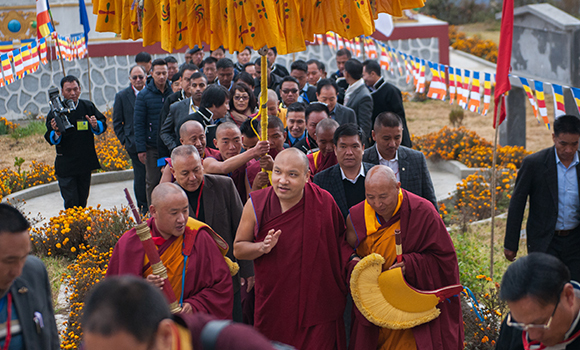 The Chief Minister related that the people of Monyul had long aspired to receive the blessings of His Holiness and hoped that the Karmapa’s spiritual blessings and guidance would help all to become better human beings. He emphasized that in these times torn by hatred and violence, the Buddhist philosophy of compassion is needed by the entire world. Finally, turning to the study of Tibetan language, dear to the Karmapa’s heart, CM Pema Khandu informed His Holiness that the study of Tibetan (Bhoti) had been introduced into the schools as a third language. The Chief Minister said that the hoped it will help people to understand the ancient Buddhist scriptures and lead to deeper spiritual lives. Afterward His Holiness departed to visit Urgyen Ling Gompa, the small, picturesque monastery of wood and white walls that marks the birthplace of the 6th Dalai Lama, Tsangyang Gyatso (1683-1706). After a very full day, the Karmapa returned to Tawang Monastery for the night. On the morning of his third day in Arunachal, His Holiness departed Tawang early, making a brief visit to Mazang Dhung Buza in the main market of Tawang on his way to Mon Parong Jangchup Choekhorling Monastery. Here he would perform a consecration ceremony at the newly built monastic complex, which belongs to his Kagyu lineage. The monks received him with a heartfelt and full traditional ceremony of welcome and made offerings of a mandala and the three supports of body, speech, and mind for his long life. 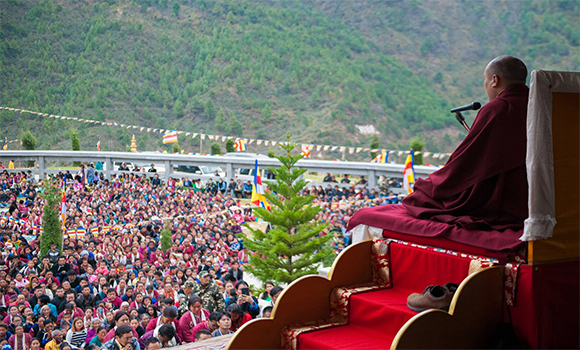 Addressing the thousands of devotees who had gathered to catch a glimpse of him and receive his blessing, His Holiness began by reciting Om Mani Padme Hung, the mantra of compassion. He asked them to turn to the Dharma as their refuge and practice throughout their daily life. The material world is impermanent, he taught, so it is better to embrace the Dharma and practice to pacify our minds and refrain from negative emotions, such as hatred and jealousy. We should purify our hearts and dedicate ourselves to helping others, he counseled. As time was short, His Holiness concluded with thanks to everyone for coming and expressed the wish to meet them all again. Afterward the Karmapa and his entourage traveled to offer their prayers at the Nyukmadung War Memorial, which enshrines a lofty stupa and a row of black marble plaques commemorating the Indian soldiers who died fighting Chinese aggression in 1962. This was followed by a brief stopover at the Kalachakra Monastery. The Karmapa proceeded onward to the town of Dirang and its Thupsung Dhargye Ling Monastery where the local HMLA Shri Phurpa Tsering led a gracious welcome and offered lunch to the Karmapa who responded with a short talk. After paying a brief visit to Palyul Jangchup Dhargye Ling Monastery (Lieung Gompa), the Karmapa finally arrived in Bomdila, headquarters for the West Kameng district. He went directly to the Upper Monastery (Gontse Gaden Rabgye Ling) where he met with a warm reception by the monastic officials and the local HMLA Shri Japu Deru. As this long and eventful day came to a close, the Karmapa spent the night at the monastery. Continuing this very activity, His Holiness first visited Bomdila’s Lower Gompa, known as Thubchok Gatsel Ling, where he was formally received by the monastics led by Guru Tulku Rinpoche. He also offered the Karmapa a mandala and the supports of body, speech, and mind in the monastery’s beautiful shrine hall. His Holiness then drove to the nearby Buddha Stadium, where he gave a public Dharma talk. Speaking to the crowd of devotees, he encouraged them to maintain peace and tranquility for the sake of a better world. He cautioned, however, “Merely propagating peace will not serve this purpose: peace must come from within.” The Karmapa further explained, “The teachings of Lord Buddha have great relevance for this materialistic world we live in, so their practice should not be limited to the ordained Sangha and the monasteries; rather, it should be followed and internalized by everyone. 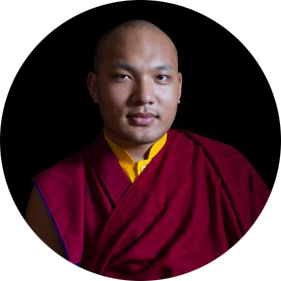 For this to happen, education is must.” Concluding his remarks, the Karmapa promised to return and interact with people on a more personal and broader scale in the future. Following lunch at Bomdila’s Lower Gompa, the Karmapa continued his many visits to monasteries and religious sites in West Kameng with brief stops at Rupa Stupa and the four monasteries of Rupa, Chillipam, Jigaon, and Shergaon. Late in the afternoon, he arrived in Kalaktang Circle at the Tibetan settlement of Tenzingaon. Here he was greeted by the Settlement’s main officer and the monastic Sangha as well as rows of lay people dressed in their best and holding long white scarves. At the end of a busy day, the Karmapa came to rest and spend the night in this cultural world of his Tibetan childhood. On the final day of his tour to Arunachal, the Karmapa first headed up a lush green valley leading east out of Kalaktang to the Gyuto Monastery. Here he bestowed blessings and a talk to the monastic and lay Tibetans of the area. As he returned west to the Kalaktang General Ground, His Holiness was accompanied by the head abbots of three monasteries, two from Bomdila and from one Dirang, as well as the State Legislative Assembly Speaker, T. N. Thongdok plus other important local legislative and administrative officials. Awaiting the Karmapa at the Kalaktang Ground was a throng of thousands of devotees, including hundreds from Bhutan, who had traveled long distances to meet him. His Holiness granted them a long-life empowerment and after giving his blessings, he left for the Kalaktang Monastery to have a final meal with his hosts. All too soon his visit had come to an end, and saying good-bye to the kind people he had met, the Karmapa departed for the helipad nearby to fly back to Guwahati and finally Delhi.